Hope This Helps You: 3-Day Training on "Healing Ourselves from Medicine"
3-Day Training on "Healing Ourselves from Medicine"
The seminar is sure to cover basic anthroposophical beliefs about the human body and diseases as well as managing common illnesses and using food (local and organic) as cure. 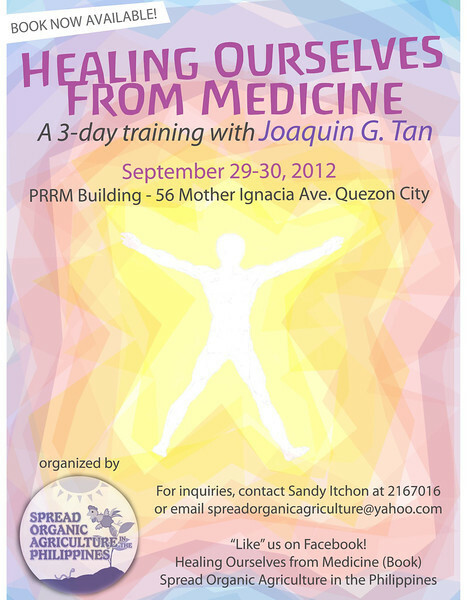 "Healing Ourselves From Medicine" (a 3-day training with Joaquin G. Tan) September 28-30, 2012. Organized by Spread Organic Agriculture in the Philippines. See poster for details or contact Sandy Itchon at 2167016 / spreadorganicagriculture@yahoo.com.